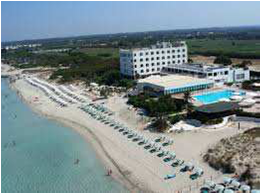 We are Marmists in Lecce who deal with marble and granite manufacturing. Let’s get in touch with distributors and retailers interested in marketing our products. I am responsible for online sales, communication and marketing, dr. Pasqualini Matteo, and I am promoting the products of this prestigious company. 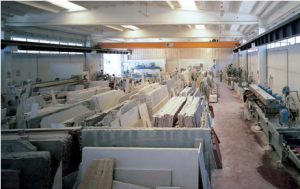 Our company has been operating in the marble, granite and stone masonry business since 1970. Having started out from a small artisanal workshop, as atrading individual business, it gradually expanded its manufacturing activity over the course of years. 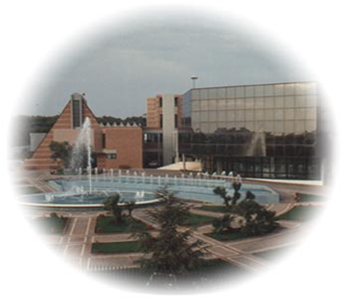 After meeting with considerable success both locally and nationally, in 1990, it became necessary to operate from an adequately sized plant (an area of approximately 5,000 m2 comprising an industrial workshop, depot-warehouse – offices and showroom) in the industrial zone of the town of Matino, which now employs around 30 people, and has enabled the company to also make a name for itself in international markets. 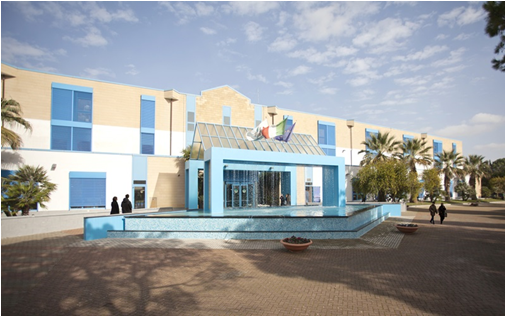 The initial activity of the Firm consisted in the processing of marble and granite slabs to make finishing elements, such as the frames and sills of doors and windows, as well as surface claddings for stairways, which was extended over time to include indoor and outdoor floorings destined for residential, office and commercial interiors, as well as wall and floor surface coverings for bathrooms and kitchens. Once this new manufacturing phase was successfully achieved, also from a commercial point of view, the company went on to expand its business with a production, which continued to be centered on stonemasonry, but started to include wood and iron working processes, enabling the production of furnishings such as tables, chairs and kitchens decorated with stone and marble inlays, applied according to the mosaic technique on a wood or iron substrate. 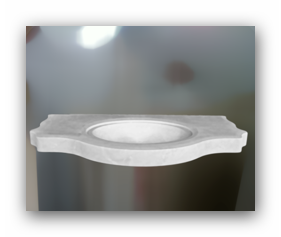 One particularly noteworthy technique of ours consists in the application of a marble veneer to a special lightweight aluminium backing, enabling us to produce any form of surface cladding (kitchen and bathroom tops, tables, baptismal fonts, etc. ), making the end product light and easy to handle, yet waterproof and resistant to all outdoor weather conditions. Recently, the creation of Tapestries has been experimented, using the mosaic technique on a canvas support. This product was presented at the Cersaie trade fair in Bologna, raising great interest among trade operators, and winning best new innovation of the exhibition. The first collection of Tapestries was created in 2001 by the well-known designer Prof. Francesco Spada, and was titled “Stones Village”. It consisted of seven tapestries which are still in production today, thanks to their outstanding appeal. Our company is the only producer of Mosaic Tapestries in marble. 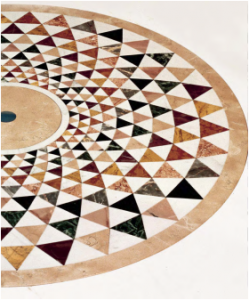 Among other projects involving the collaboration with Prof. Spada was a reproduction the floor of Otranto Cathedral, the Tree of Life. 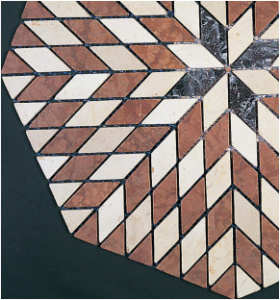 This collection of mosaic panels, titled “Il Bestiario”, was presented at Abitare il Tempo 2003, in Verona. Our Tapestries have achieved outstanding success in the Arab Emirates where numerous sheiks have commissioned mosaic reproductions of their own portraits. Our company has exhibited regularly at the Salone Internazionale della Ceramica and CERSAIE Arredobagno (Bologna) since 1995. It has also taken part in various trade fairs abroad: Bau – Munich (Germany), Spoga – Cologne (Germany), Saudi Furniture & Interiors (Riyadh), Covering – Orlando-Florida (US), during which a moving tapestry was donated to the City of New York, under the patronage of the City of Matino, to commemorate the firemen who lost their lives in the Twin Tower terrorist attack of September 11th. The company has also exhibited several times at the Salone Internazionale del Mobile, in Milan, and at Medistone Expo, in Bari. Our clientele is varied, and we use several sales channels to market our products: we have a sales network of agents and direct retailers in Italy and Europe, and collaborate with architectural firms, distributors and importers both in Italy and abroad. From 2003 to 2008, our company was an official supplier of marble to the MARAZZI Group (supplying: mosaic works, modular marble, capitals, Greek frets, trims and numerous special projects). – Edoardo Filograna Foundation, Casarano, Lecce – Cinema Theatre Schipa, Gallipoli. Of particular impact is the sculpture covered in gold leaf mosaic tesserae, commissioned by the Gruppo Filanto Spa, of a design by architect Torresan, Milan, to commemorate the victims of workplace accidents, which is located in Casarano, Lecce province. We are proud to have executed numerous projects on behalf of the Municipal authorities of many Italian towns and cities which have commissioned mosaics/tapestries representing their heraldic coat of arms (Matino, Gallipoli, Alezio). Also of particular interest is the reinterpretation in an African key of the twelve Stations of the Cross, in the form of decorative mosaic panels, commissioned by the architectural firm Integra of Rome, and destined for a church in Africa. Owing to the experience we have built up in the course of the years, and also thanks to the expertise of our staff and external partners, we continue to be a young and dynamic company, with an unfailing attention to market needs and a capacity for launching new projects and ideas using innovative materials, together with the traditional raw materials of our trade, which enables us to identify many different applications for our products. Our company utilise artisanal and/or semi industrial techniques in its production (according to the customer’s requirements) in its production plant in Lecce. 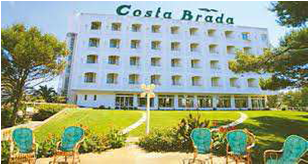 Our product range, as indicated in the previous paragraph, is extremely vast. All of our products may be custom-made to the specifications of the end-customer, no matter how “challenging” they prove to be. Size is not a problem either! In fact, even if the product requested by the end-customer happens to be particularly large, it will be packaged in numbered sections which may easily be “assembled” on site, like a puzzle. 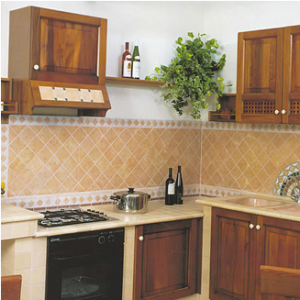 “THE BEAUTY OF NATURAL STONE ARTFULLY CRAFTED..
..linear harmony, the kindling of fantastic geometric patterns…. create cornices, roses, simple yet effective trims, imaginative decorations. THIS IS HOW THE COMPANY DESCRIBES ITS WORK, AND THIS IS WHAT IT MEANS TO ENTRUST THE EXECUTION OF YOUR PROJECT TO OUR COMPANY. 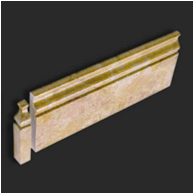 – MODULAR MARBLE: 3 cm thick marble slabs are used for this purpose. 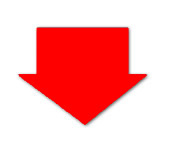 Once they are cut in the required format (e.g. 30×30), they are split and then calibrated to a thickness of 1 cm before being bevelled, finally they are polished or antiqued (using eco-friendly non-polluting products). – MOSAIC: achieved using thick slabs. 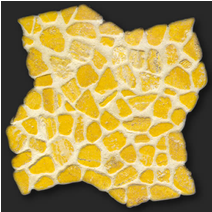 After the cutting-splitting and calibration to 0.7mm phases, the tesserae are then mechanically or manually cut (1.5×1.5 – 3×3 etc.) . They are subsequently arranged on a fibreglass mesh and attached using special glues. – TABLES: these are made in an aluminium honeycomb structure and clad with 0.5 mm thick over the entire surface. In this way, the end product is lightweight and easy to move. All manufacturing processes are carried out without using harmful and/or toxic products. 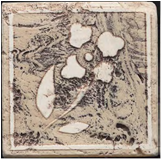 4) roses and central floor decorations: these are produced using the inlay (laser cutting), mosaic or cobblestone (tumbled tesserae) techniques and may, in any case, be manufactured to customer specification. 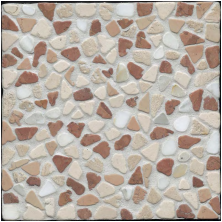 6) cobblestones: these are small tumbled tiles suitable for flooring or rustic claddings. 7) Palladian cobblestones: differently shaped tumbled cobblestones pre-arranged on fibreglass mesh. 8) tapestries: lightweight wall decorations used to embellish interiors (such as hotel lobbies). 10) tables for gardens and verandas: what makes these tables remarkable is that they are as light as wood, due to the fact that they are built on an aluminium honeycomb structure. 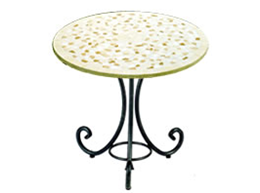 The table base is in hand-wrought iron. 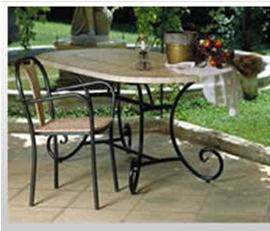 This product may be supplied without the iron base if the buyer is a company in the garden furnishing business. Moreover, they may be modified and customized to the specifications of the end-customer. Mosaics, which belong to a great tradition, are reinterpreted to meet modern tastes. They may be produced in standard formats or as artworks made to customer specifications: these are works of extraordinary appeal owing to the surprising and marvellous nuanced effects that custom-made mosaics produce. These are produced using the inlay, mosaic and cobblestone techniques, also to the specifications of the end-customer. Differently shaped small tumbled cobblestones pre-arranged on fibreglass mesh. These tapestries are actually mosaics set on a lightweight flexible support. Our company is the only manufacturer of this product. Each mosaic-tapestry is a unique piece of artwork, strictly hand-made according to the rules of the thousand year-old craft of mosaic making. 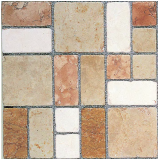 Made from 4-5 mm thick marble tesserae, they may be traditional or modern in style to suit any type of interior. Eye-catching tapestries that confer prestige and refinement to the interiors they adorn. 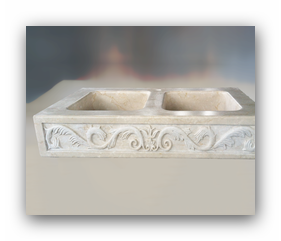 Each piece we create has been specifically studied to embellish your gardens and terraces. What makes them truly remarkable is the fact that they are so lightweight, having been constructed on a lightweight aluminium honeycomb support, with a hand-wrought iron base. Like our other products, they may be customized. High quality products delivered on time. Even for products involving large surface areas, transport and installation become simple and intuitive since the components are divided, clearly numbered and shipped in the same packaging. To install, just put them together like a puzzle. 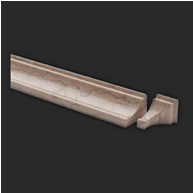 Since all of our products are produced in thicknesses ranging from 4-5 mm to 1 cm, or made to look solid (lightened marble), this reduces transport and installation costs considerably, as well as providing a product that is easier to handle. One of Egram’s strong points is the fact that no harmful products are employed in its manufacturing processes. Our typical clients are wholesale distributors or real estate developers – while we don’t do business with customers operating exclusively in the ceramics industry. End-customers, if required, may be assisted in their definitive choice with technical advice regarding the installation and maintenance of our products since we are constantly available to solve any problem or doubt that may arise. We can draw up projects based on the presentation of a floor plan, consulting customers with regard to their choice of colour palette and the types of marble/stone they wish to use, and sending photos of the chosen colours and indications of their positioning. Once each and every detail has been approved by the end-customer, we move to the production phase. 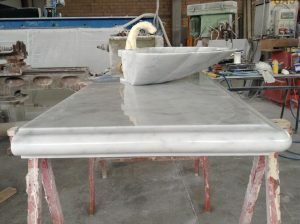 Our technique also consists in applying a marble veneer to special lightweight substrates in aluminium which allows us to create any type of surface cladding (bathroom and kitchen tops, tables, baptismal fonts etc.) and makes the finished artefact light and easy to handle but also waterproof and resistant to any adverse weather conditions when used out of doors. Our company has exhibited regularly at CERSAIE, the International trade fair of Cerarmics and Bathroom Furnishings (held in Bologna) since 1995. 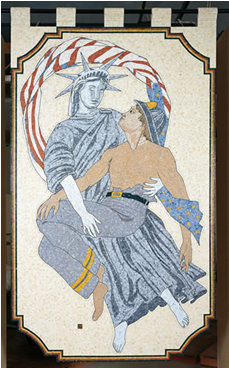 The company has also participated at various trade fairs abroad: Bau – Munich (Germany); Spoga – Cologne (Germany); Saudi Furniture & Interiors (Riyadh); Covering –Orlando-Florida (America), during which a fine tapestry was donated to the City of New York, under the patronage of the City of Matino, to commemorate the firemen who lost their lives in the Twin Tower terrorist attack of 11 September. We have taken part on several occasions at the Salone Internazionale del Mobile in Milan, and at Medistone Expo in Bari. Our Tapestries have met with outstanding success in the Arab Emirates where numerous sheiks have commissioned mosaic reproductions of their own portraits. Our clientele is a variegated one and we use several sales channels to reach them: we have a network of agents and direct retailers in Italy and Europe, and we collaborate with architectural firms, distributors and importers both in Italy and abroad. Alongside our customary products, we have recently experimented the creation of Tapestries using the mosaic technique on a canvas support; this product was presented at the Cersaie trade fair in Bologna and raised great interest among trade operators, as well as receiving an award as a novelty of the exhibition. 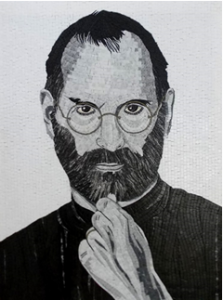 In 2001, the first collection of Tapestries, going under the name of “Stones Village”, was created by the well-known designer Prof. Francesco Spada. It was made up of seven tapestries which are still in production today, owing to their outstanding appeal. 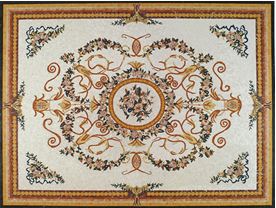 We are the only company producing marble Mosaic Tapestries. 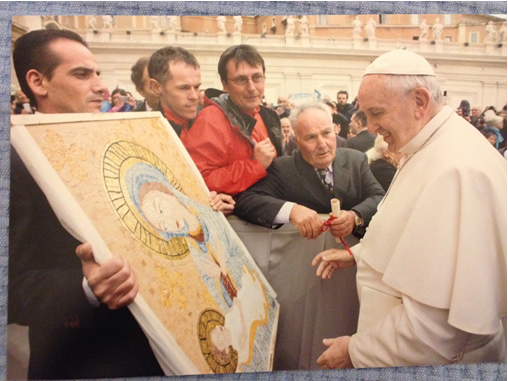 Among other projects involving our collaboration with prof. Spada we like to recall the one reproducing the floor of Otranto Cathedral, the Tree of Life. Our Tapestries have been particularly successful in the Arab Emirates where numerous sheiks have commissioned mosaic reproductions of their own portraits. 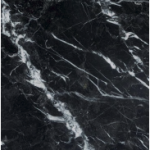 From 2003 to 2008, our company was an official supplier of marble to the MARAZZI Group (supplying: mosaic elements, modular marble, capitals, Greek frets, trims and numerous special projects). Particularly striking is the sculpture clad in gold leaf mosaic tesserae, commissioned by the Gruppo Filanto Spa, to a design by architect Torresan, Milan, to commemorate the victims of workplace accidents, which is positioned in Casarano, Lecce province. Also of particular interest is the reinterpretation in an African key of the twelve Stations of the Cross, in the form of decorative mosaic panels, commissioned by the architectural firm Integra, Rome, and destined for a church in Africa. and will answer your dott. Pasqualini Matteo, Online Marketing Manager, Marketing and Communication within the project “ITALIA ESPORTA“, a portal for the internationalization of Italian products and companies around the world. 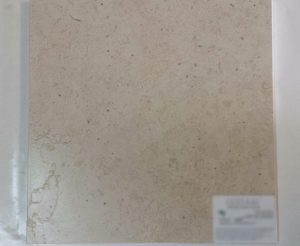 Siamo un’azienda marmista di Lecce specializzata in produzione e lavorazione artigianale di marmi per l’ottenimento di modulmarmo. 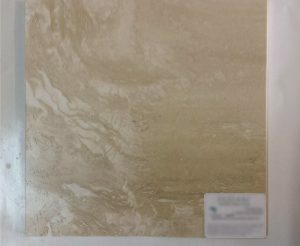 Abbiamo uno stock a magazzino di 500 mq di MODULMARMO per pavimenti e rivestimenti in marmo. Questo è stato prodotto dalla nostra azienda con marmo esclusivamente “Made in Italy”. Il BIANCO DI TRANI è una pietra pugliese proveniente dalle cave di Trani, è una pietra dura e compatta è adatta per superfici sia interne che esterne la colorazione è chiara, adatta per qualsiasi ambiente sia moderno che classico può essere usata sia in ambienti di nuova costruzione che in locali da ristrutturare. Il TRAVERTINO ALABASTRINO è un travertino proveniente dalle cave di Tivoli. Allo stato grezzo si presenta forato (caratteristica propria del travertino) in fase di lavorazione i fori verranno stuccati con mastici e resine particolari per poi ottenere una superfice compatta. Per quanto riguarda la materia della pietra c’è solo da dire che l’intera ROMA antica è stata costruita con questo materiale: Vaticano, Colosseo, ecc..
quindi è una pietra millenaria e duratura nel tempo la colorazione è chiara, adatta per qualsiasi ambiente sia moderno che classico può essere usata sia in ambienti di nuova costruzione che in locali da ristrutturare. Grazie per l’attenzione, buon lavoro e cordiali saluti. 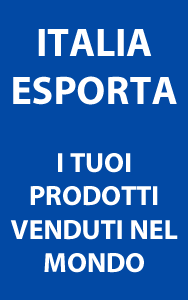 Oggi siamo a segnalarvi un’azienda marmista Brescia specializzata in produzione e lavorazione artigianale di marmi, per la creazione di prodotti artistici, unici ed irripetibili tipicamente “Made in Italy” e che ci ha dato mandato per entrare in contatto con distributori interessati a vendere i loro prodotti. 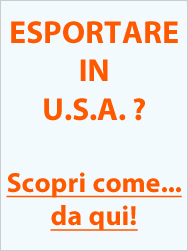 Sono il responsabile commerciale online di ITALIA ESPORTA & COMECERCARECLIENTI, dott. Pasqualini Matteo, e sto promuovendo i prodotti di questa prestigiosa azienda che si occupa di “produzione e lavorazione marmi”. Perchè ci differenziamo rispetto ai nostri concorrenti? Questa azienda si occupa della produzione del marmo rivolgendosi a tutto il mercato dell’edilizia, fin dagli anni ’60. Il titolare ha cominciato fin da giovane a lavorare con la ditta famigliare, iniziando poi i suoi viaggi di ricerca e sviluppo aziendale ed ora porta avanti questa tradizione di famiglia. Le produzioni che partono dai singoli blocchi di marmo sono destinate a progetti residenziali, commerciali ed industriali e sono caratterizzate dal prestigio del Made in Italy. Giorno dopo giorno, questa aizenda afferma il proprio impegno a realizzare prodotti unici ad elevato valore tecnico-estetico, caratterizzati dall’eccellenza di un design evoluto: il prodotto che viene offerto è un prodotto di altissima qualità e di elevate finiture. Le creazioni sono risultati della ricerca e dello sviluppo interni all’azienda, un patrimonio di conoscenza “sedimentato nel tempo” che permette di realizzare lavori a loro volta unici e personalizzati su quelle che sono le esigenze del cliente finale. L’esperienza maturata negli anni permette di proporre un prodotto di elevatissima qualità proprio perchè vi è una conoscenza approfondita del marmo: nonostante infatti l’alta tecnologia utilizzata, sulla quale vi è un continuo investimento aziendale, è sempre la mano dell’uomo (il titolare) a fare la differenza! Questa azienda produce e lavora il marmo in maniera artigianale nella propria sede operativa. Essendo una produzione artigianale ogni pezzo può essere personalizzato sulla base di quelle che sono le esigenze del cliente, offrendo così un prodotto UNICO ED IRRIPETIBILE nel suo genere. L’unicità del pezzo e l’artigianalità insita viene dimostrata dal fatto che le tempistiche per la realizzazione richiedono spetto tempi molto lunghi (anche giorni e/o settimane per la loro finalizzazione). In un contesto artigianale, ma pur caratterizzato dall’utilizzo di macchinari all’avanguardia, tecnologicamente avanzati, questa azienda fa nascere da un blocco di marmo informe le più svariate creazioni, tra le quali spiccano ad esempio lavabi, vasche, colonne e caminetti. 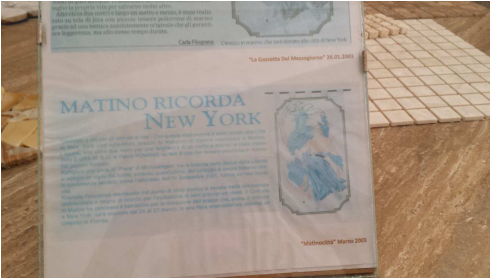 A riprova della qualità del prodotto offerto questa azienda risulta essere licenziataria fin dal 2006 del Marchio Collettivo Registrato “Marmo Botticino Classico”, necessario per la commercializzazione per l’appunto del pregiatissimo Marmo Botticino Classico. Essendo quindi prodotti artigianali è fortissima la componente “personale”: sia quella del titolare che plasma con mano esperta la natura attraverso l’utilizzo della tecnologia, sia quella del cliente finale che è colui che decide come deve essere la creazione e che trova pertanto nell’artigiano colui che è in grado di tradurre in realtà ciò che è nel suo immaginario. Ecco perchè questi prodotti non sono solo dei prodotti artigianali, ma hanno anche una fortissima componente artistica. Arrivo e stoccaggio della materia prima in blocchi suddivisi in base alla tipologia di MARMO. Viene eseguita attraverso telai a lame diamantate che consentono la segagione dei materiali “teneri” come ad esempio i vari tipi di marmo, travertini, pietre e similari. Tutti i lavori si effettuano in base alle esigenze specifiche di ogni cliente con macchinari che si basano su una tecnologia altamente specialistica, sui quali si continua ad investire per rispondere alle richieste del cliente. I nostri prodotti derivano sempre e comunque dalla lavorazione del marmo che notoriamente è un prodotto naturale. Questo può esser lavorato creando un effetto bagnato dato che il marmo idrorepellente lo è sempre. E’ quindi “madre natura” che “parla” anche se poi il materiale di base può essere trattato secondo modalità differenti: il repellente è neutro, oppure si può applicare quello che determina appunto l’effetto bagnato o si possono avviare altre lavorazioni a seconda dei desideri del committente. Non è quindi certo paragonabile ad altri tipi di materiale (come ad esempio l’acciaio). I nostri sono quindi prodotti quasi artistici dato che tale componente (l’arte) è molto importante. Non sono quindi prodotti “industriali” ma decisamente artigianali. Siamo orgogliosi di tutti i nostri lavori di decorazione, che contraddistinguono questa azienda e che ci rendono un’azienda artigiana di eccellenza. Decorazione che può essere anche appesa ancorandola al muro… perfetta per gli interni delle imbarcazioni ad esempio. Anche le immagini sacre, eseguite su commissione dei nostri clienti, fanno parte delle nostre lavorazioni. E al bisogno ci occupiamo anche di restauri. E’ importante ricordare che tutte le lavorazioni, essendo artigianali al 100%, possono essere personalizzate ad hoc per rispondere a quelle che sono le richieste del cliente finale. Grazie al fatto che l’azienda è dotata delle ultime tecnologie (software) per la lavorazione e personalizzazione del marmo ad esempio possono venir realizzate scritte in basso rilievo anche nelle parti curvate. Il titolare infatti, nell’ottica di garantire sempre una risposta pronta alle esigenze in continua evoluzione del mercato e della clientela, investe continuamente in tecnologie e macchinari sempre più all’avanguardia. Tutti i prodotti possono essere infatti spediti ovunque il cliente ne richiede la posa. Anche all’estero. Viene inoltre valutato di volta in volta se prima di avviare la lavorazione, il luogo di posa debba essere fatto visitare dal nostro geometra di fiducia oppure se prima di essa sia necessario far raggiungere il cantiere dalle nostre squadre di posatori. Queste sono fornite nel caso in cui il cliente finale lo ritenga necessario, in modo tale che poi non ci siano “sorprese” in questa importante fase di consegna del lavoro finito. Il servizio che viene fornito all’occorrenza è quindi a 360°, in modo tale che il cliente finale sia soddisfatto al 100% dei nostri servizi e prodotti. Perchè come questa azienda è fiera del proprio lavoro, allo stesso modo vuole che il cliente finale sia orgoglioso del prodotto acquisto. 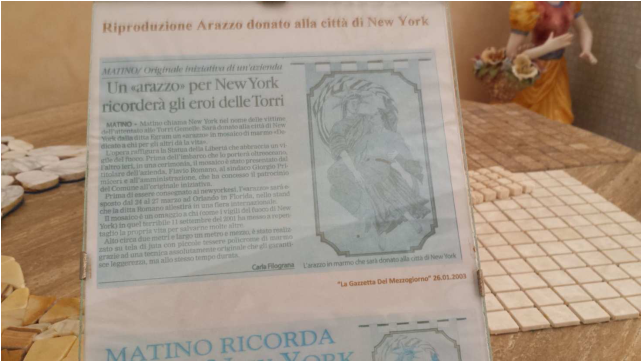 Uno dei punti di forza è proprio il fatto di risultare licenziataria fin dal 2006 del Marchio Collettivo Registrato “Marmo Botticino Classico”, necessario per la commercializzazione per l’appunto del pregiatissimo Marmo Botticino Classico. Quindi l’utilizzo di un materiale naturale e pregiatissimo come il Marmo Botticino Classico, unito al continuo investimento in tecnologie all’avanguardia, il tutto lavorato con l’esperienza e la mano attenta del titolare, permettono di dar vita a creazioni uniche in cui l’artigianalità si fonde con l’arte. Solo una clientela di un certo tipo può apprezzare questo prodotto, cogliendone le caratteristiche di artigianalità e di altissima qualità della materia prima fornita. Non possono essere avviate lavorazioni su larga scala, anche perchè essendo un prodotto di alta gamma non potrebbe essere realizzato in tempi brevi; come invece avviene per i prodotti di medio/bassa qualità. Usualmente le campionature di prodotto già presenti in visione nel nostro show room e il “passaparola” sono i nostri strumenti principali per diffondere la conoscenza di questi prodotti. E’ il cliente che solito viene in laboratorio attraverso il classico passaparola perchè ha visto altri lavori che sono stati conclusi e posizionati in altri luoghi e sono stati quindi di suo interesse e gradimento. Nonostante infatti venga utilizzata la tecnologia più all’avanguardia e innovativa, dietro queste creazioni si può sempre intravedere la mano esperta del titolare che come un regista coordina tutto per creare il prodotto finale così come da idea iniziale del cliente. Ci rivolgiamo sia al mercato italiano che al mercato estero: per quest’ultimo però ci avvaliamo di figure intermediarie che poi si relazionano con il cliente finale. Spesso, infatti, veniamo contattati direttamente dal cliente finale, ma altrettanto spesso le nostre produzioni ci vengono commissionate da architetti e direttori dei lavori. Loro conoscono il nostro modus operandi e sanno che utilizziamo per le nostre creazioni dei materiali che sono una garanzia. Unitamente al fatto di essere sempre disponibili a soddisfare qualsiasi necessità e desiderio del loro cliente finale. Chi vorrà entrare in contatto con questa azienda, ci contatti ai nostri numeri sotto riportati.